PostgreSQL firewall by DataSunrise ensures database security against external and internal threats. It inspects each incoming SQL query and blocks those of them that are defined as prohibited ones. Access privileges are controlled in accordance with security policies. 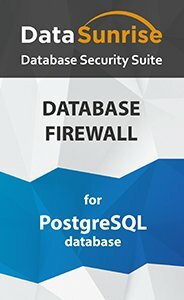 PostgreSQL firewall by DataSunrise is a powerful tool for protection PostgreSQL – the world's most advanced open source database. It monitors database traffic non-stop and processes incoming queries and database responses, continuously analyzes database activity and accurately captures behavior that contradicts the administrator-defined security policies. The firewall is deployed as a proxy. It provides an increased level of protection, deep packet filtering, and detailed logging. Residing between the database and clients the firewalls audits and controls traffic intercepting packets with malicious code. Deep traffic inspection guarantees higher level of security against various types of intrusion. Special smart algorithms provide continuous monitoring of database activity and SQL injection prevention. DataSunrise blocks fundamental SQL injection techniques, including union-based exploitation, boolean-based exploitation, out-of-band exploitation and others. After the firewall is initially deployed, the learning mode is activated. DataSunrise analyzes incoming SQL traffic and forms a list of the queries commonly met across a given environment. Typical queries are assumed to be safe and, therefore, are permitted. Everything else is blocked. Suporting Kerberos protocol DataSunrise Database Firewall can function as an authentication proxy. Configure user mapping and the firewall will take care that only users included in the Active Directory domain can reach the databases with sensitive. PostgreSQL firewall by DataSunrise supports the latest PostgreSQL Database releases (versions 7.4-9.5.2) and runs on Windows and Linux.